120 Chloride St is four intersections from the Post Office heading NW in Chloride Street. 416 Beryl St is within 5 minutes walk of Post Office. Cottage Charm close walking distance to Central Business district. Close to restaurants, clubs and hotels. Cottage consists of two bedrooms, sleeps four. Lounge with television and DVD, dining room, kitchen, bathroom with spa bath, enclosed verandah with lounge & TV, laundry which has attached a wheel chair friendly shower room, interior and exterior toilets. BBQ, entertainment area. Rear access with secure off street parking. Cot and high chair available on request. Pets allowed - conditions apply. Playground in Sturt Park only a two minute walk from the cottage. 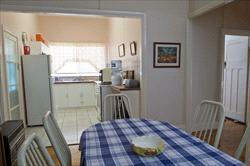 Gretta's Place:416 Beryl Street Fully self contained, clean linen is supplied weekly. Starter quantities of expendable items (tea, coffee, sugar, milk, bread, fresh eggs,bacon & sausages (1st morning), detergent, garbage bags, tissues and toilet paper. Cottage consists of 3 bedrooms, sleeps seven. Spacious lounge with TV & DVD, dining room fully equipped kitchen, bathroom, shower room, interior & exterior toilets. BBQ entertainment area. Rear access with secure off street parking. Cot & high chair available on request. 5 minute walk to PO & CBD. Pets allowed - conditions apply. 2 queen size beds - all linen provided. 48 hours notice is to be given to recieve a full refund. Failure to notify of cancellation within 48 hours prior to arrival will forfeit one nights accommodation at the operators discretion.